Uncle Pig-Sty and the whole Hogerson clan were happy, happy, happy at World Pork Expo as Automated Production Systems (AP) presented Hog Swine-asty for this year’s theme – and that’s a fact, Jack..
Every year AP has a different theme for their tender whole roast hog and they really go “whole hog” with costumes, music and even fun audience participation. This year it was a pig calling contest to tie-in with the Duck Dynasty reality clan’s duck call business. When they are not dressing up roasted pigs and going hog wild, the AP folks are busy producing and selling all types of hog operation equipment – for feeding, watering, climate control, data collection and more. AP is a part of GSI (Grain Systems Inc.), a worldwide brand of AGCO Corporation. 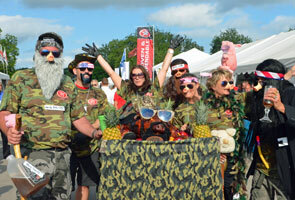 Check out the Hog Swine-asty party in this video. Check out more pics of AP’s Hog Swine-asty in the 2014 World Pork Expo photo album.